One Momma Saving Money: Disney movies under $10 each! 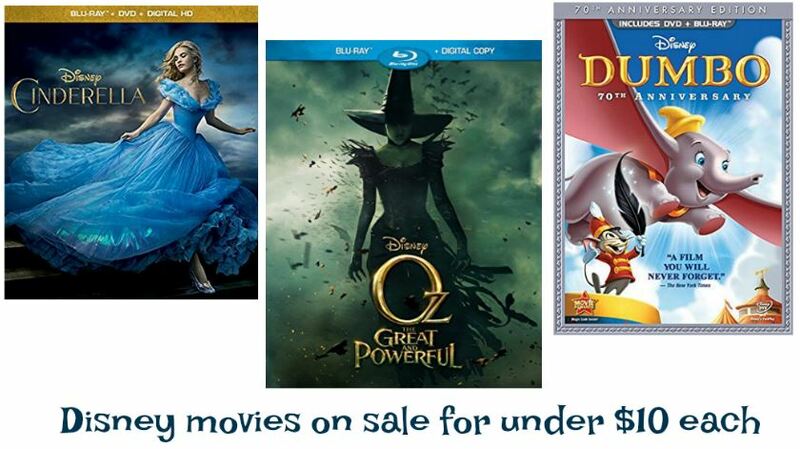 Disney movies under $10 each! Pick up now and put away for Easter! Disney’s Dumbo 70th Anniversary Edition Blu-ray + DVD is on sale for only $9.99! Cinderella DVD + Digital Copy + Blu-ray on sale for only $9.99! Oz the Great and Powerful Digital Copy Included Blu-ray + Digital on sale for only $9.99! Atlantis: Two-Movie Collection: (The Lost Empire / Atlantis: Milo's Return) DVD + Blu-ray on sale for only $9.99! Robin Hood 40th Anniversary Edition DVD + Blu-ray + Digital on sale for only $9.99! Sword in the Stone DVD + Blu-ray + Digital on sale for only $9.99! The Aristocats DVD and Blu-ray on sale for only $9.99!